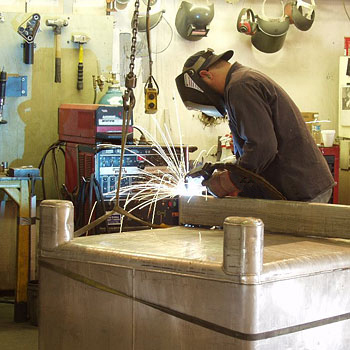 UN31A and DOT57 Certified Welders averaging 20 years of experience in TIG, MIG and Stick (ARC) welding of Stainless Steel, Aluminum, Carbon Steel and plasma cutting services. If it can be cut and welded together then our expert team can design a product or solution for just about your every need. Our philosophy combines System Optimization with component eloquence for performance, reliability and economy. We bring innovation, experience and success with product deployment – ultimately, Empowering Your Profitability. We provide the best service, and we back that with Customer Satisfaction. It is our work ethic, attention to detail, and drive for excellence that keep customers coming back.